Many people, from employers to employees, believe in the extrinsic motivation of rewards to get people interested in something. This is despite evidence showing the opposite is true. source, sourceMany people think money is most important, or that other people think money is most important, so they try to lead people with a carrot to get them interested in doing something by getting money for it, not because they are interested in actually doing it. 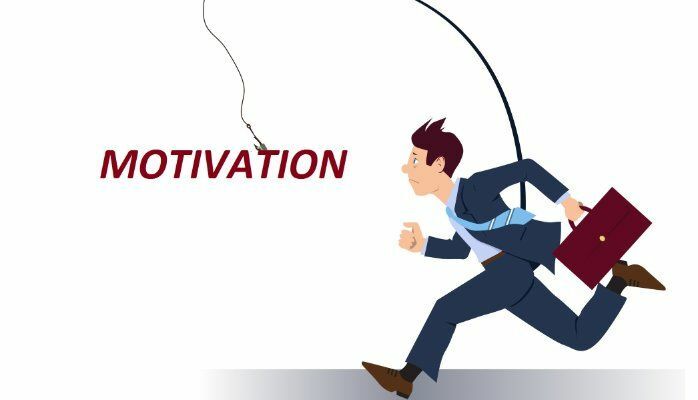 sourceA new study published in the journal Motivation Science on Jan. 16, says there is and enormous amount of empirical research that shows the harmful effects of extrinsic incentives (like money, competition prizes, rewards, etc.) on our intrinsic motivations. 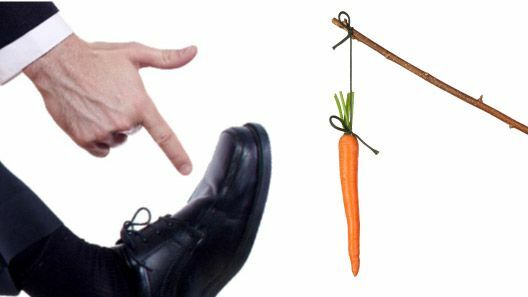 The extrinsic incentives undermine our intrinsic motivations, yet most people still believe the opposite is the reality. People think extrinsic incentives result in improved future performance, and this drives much of our behavior and way of life in society. I refer to this as the real meaningful substance within us, that motivates us, being overridden by superficial appearances that play on baser instincts. 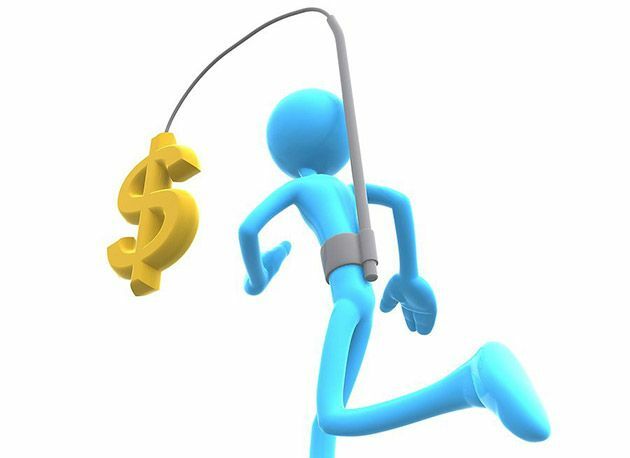 Past research has found that offering extrinsic incentives to motivate certain behavior, such as financial or other rewards, does lead to short-term improvements. However, those who receive the carrot to lead them to do something are often less interested in doing the task. sourceThe money is only a temporary motivator, but not something that taps into the core of our values to motivate us. Many people in society operate this way with a focus on materialism and accumulating objects or cycling through them by always getting new things. None of this fills what is missing. It’s only a false proxy that acts as a substitute and gives a temporary satisfaction. And people are motivated to continue in that behavior because it makes them feel good to have that satisfaction of getting something they desire. But it’s not a deep core meaningful desire that is being fulfilled. When someone isn’t doing something, it’s not simply that they are lazy. It could be that they just don’t care about what they are “supposed” to do, like a task in order to get rewarded with a paycheck. sourceThe intrinsic motivation that drives us (what we care or desire to do) matters in life. We can adopt new things to care about, and realize some things we care about are not good for us. We can change. For the study, the researchers wanted to know how people think our intrinsic motivations are affected by extrinsic incentives. Participants are asked to judge if this benefited or was detrimental to recipients of extrinsic influence. They were given the description of a previous experiment which demonstrated the undermining effect of extrinsic incentives on intrinsic motivations. Then they were asked to make a prediction about the effect of the incentives on motivation of the recipients they were evaluating. The majority of participants were firm and adamant about their predictions that they believed rewards had a beneficial effect on intrinsic motivations. Those who were wrong and believed the incentives help intrinsic motivation were wrong, but had more confidence that they were right than those who actually guessed right. This is known to be wrong, as the results demonstrate, except people still believe this myth that extrinsic incentives actually helps our intrinsic motivation to do things. Our society is still reliant upon extrinsic incentives to motivate people to do things. 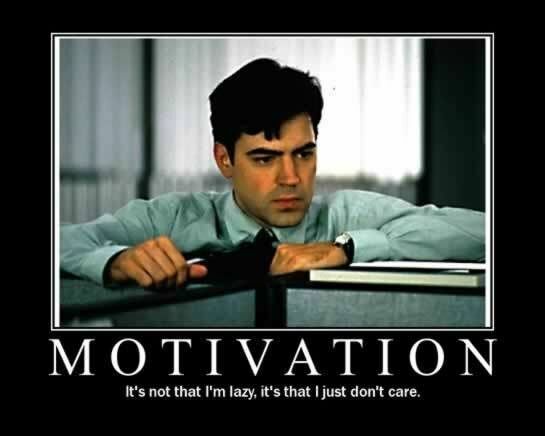 We still have an inaccurate belief about motivation that pervades as a frequent use in our society. The study suggests that stakeholders beliefs in continuing to promote this type of behavior is to be targeted as part of intervention research to get people to think differently. sourceYou can get a child to behave temporarily, in the short term, but does doesn’t motivate them to actually change their behavior to behave all the time. It just incentivizes and motivates them to engage in certain behavior in order to receive a reward, just like those who are addicted to shopping or attaining material things. Rewarding people to study or work more doesn’t function in the long term. It is leading them with the carrot for survival, with money as an immediate gain that is motivating them. The money is what motivates them. They don’t have the intrinsic gain and desire to do it themselves. The incentive is continually required in order to reproduce the same behavior or else the false motivation is not induced because the true motivation is never actually there. sourceRewards become the focus, not the task. Rewards become continuously desired in order to do a task, otherwise the task is not desirable to perform. The study recognizes that rewards in our society are used to control the behaviors of others. Money is a powerful incentive to get people to do things. There is even the belief, urban legend or maybe it’s a reality, that some people would kill their grandmothers for money. Money has become so powerful in our worldview and sense of self, self-value and self-worth, and our evaluation of others, that money has supplanted the place of a “God”, as an all-pervading force in our lives. Many people believe that without money nothing would be possible, that human life would not be possible. We end up chasing a false motivator of money or rewards, instead of looking within to understand what really matters to motivate us to act towards that instead. sourceInstead of relying on rewards, respecting individual autonomy and understanding intrinsic motivation is an alternative strategy that could achieve better results. Creating and providing an environment that meets people’s inner core motivational desires, such as wanting to receive and pay attention and connect with others, is what will improve satisfaction within that environment, community or organization. 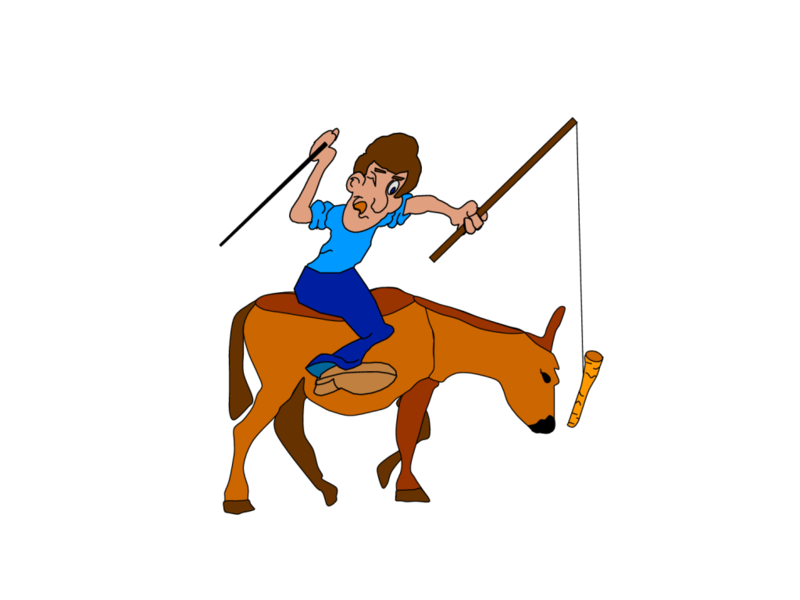 Rather than the threat of the stick, or the reward of the carrot on a stick, there are better ways to understand why we do things and how to do something else or change and do something new. Temporary compliance to engage in a behavior is not a motivation coming from within the person where they fuel themselves. More authentic, genuine, real, true motivational understanding can be developed by understanding what is going on. Trying to get children to become more ethical and rational decision-makers is unlikely to be helped by punishment or threats to elicit temporary compliance. Anyone who has children probably knows how difficult that is. Whenever we think of consequences to our actions, or are told there will be, we often don’t like it. We often want to do whatever we want. Facing possible consequence can engender anger, defiance or a desire for revenge. This applies to children and adults. Instead of the power of punishment, some people turn to rewards in order to motivate changes in the behavior of others. Inducing someone to learn or comply with demands or a request is not feeding deeper intrinsic desires or needs that would fuel the person to act on their own. Common practices in schools are to reward stickers and stars, A’s and praises, and awards and privileges. Instead of doing what motivates us, children and adults are being led down predetermined and preselected pathways to conform and promote the current condition and system of living. We get trained into certain categories of knowledge in our outcome-based education. We don’t get taught how to really think for ourselves. The carrot is not much more effective than stick to help people become more responsible and self-directed learners and achievers. When rewards stop, people usually return to their previous behavior. The deep core motivation was never there. Once the falser proxy motivation is removed, there is no more motivation. Getting rewarded for something can lead to an expectation of getting those rewards, and possibly a sense of entitlement to continue receiving it. Losing what we were getting ties into psychology of loss aversion, and also the endowment effect. We are willing to invest more to keep something that we own than to get something new. This applies psychologically in the rewards we get as well, since we don’t want to lose those rewards. If we do lose them, it hurts more. When we get rewards to get us to do something (not just as a bonus that we don’t know is coming or expected), then we can develop the over-justification effect. Expecting an external incentive (like money or other rewards like prizes), decreases the intrinsic motivation to perform a task. A task that was done unrewarded and motivated internally, will be undermined with an external motivator to perform a function. If the external pseudo-motivator is not there, then it’s gone and the prior intrinsic motivation doesn’t return. Then the extrinsic rewards have to be repeatedly offered as a motivation to keep someone satisfied and maintain their activity. The requirements to feed our emotional or cognitive commitments are not being met. The underlying behavior is never truly changed from within ourselves. Both punishment and rewards are trying to manipulate someone into certain behavior, rather than have them understand to need to do it. Empowerment through understanding is much more substantive,meaningful and lasting to affect our behavior, than a simple carrot as reward or stick as punishment. In either case, the motivation isn’t coming from *why someone should really be doing something. A deeper, substantive, more meaningful reason to motivate ourselves to do something is missing when we are simply being led by a carrot to do something. Doing something because we want to do it, means we are more likely to do it for itself. Doing something for a reward primarily, means we are more likely to not want to do it when the reward is removed. Those who do something for “nothing” in terms of a promised reward, will do it better than those who are doing something for something they are told they will be rewarded with. Will rewards motivate people? Yes. Rewards will motivate people to get rewards. Using rewards to motivate people will not motivate them to be interested in or excel at what they are doing. As you can tell, this ties into quality. Being interested in something and excelling at it, compared to others who aren’t interested yet do it anyways, will promote more quality in general no matter what is being done. 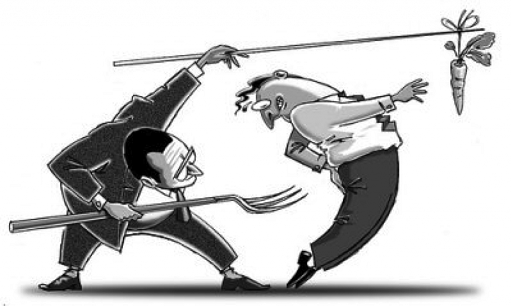 Successes and failures in general can be seen as a learning experience, rather than something that has associated rewards of punishments for doing it (even though some actions do have serious consequences). Honest appreciation is different that reward behavior, as long as the vocal rewards of encouragement and praise aren’t blindly given all the time to render them counter-productive or even meaningless. When engagement is self-directed through our own internal intrinsic motivation, that is what will create lasting motivation to engage in something. If the desired engagement can’t be actualized, then motivation is stifled and is suppressed. When the freedom to create and interact with others is enhanced, engagement follows. When rewards are used to channel (manipulate, control) people into doing something, that freedom and autonomy gets restricted because now they are doing something specific based on a reward, not based on doing it for itself or a more meaningful reason or valuation. When real value and meaning are present, the rewards are not required, and are ultimately destructive in many ways.